Undercover at the shopping centre, the Wabbit spotted more of his enemies and he wondered why. But he was intent on his task. What relevance did Ice Mice have for his quest to find the Drink Thief? Could they be stealing his new invention, Wabbit’s Cola? The Wabbit decided to attract their attention. "Ice Mice, may I interest you in a Telepass?" he chortled chirpily. "No stopping for highway tolls. You can skip the lines!" "Don’t care," said an Ice Mouse. "We usually do." "Then perhaps I can offer you a deal for your delicious drinks," simpered the Wabbit. "What kind of a deal?" snarled an Ice Mouse. He turned and the Wabbit caught sight of his Cola. He could see it wasn't his, so he changed tactics. 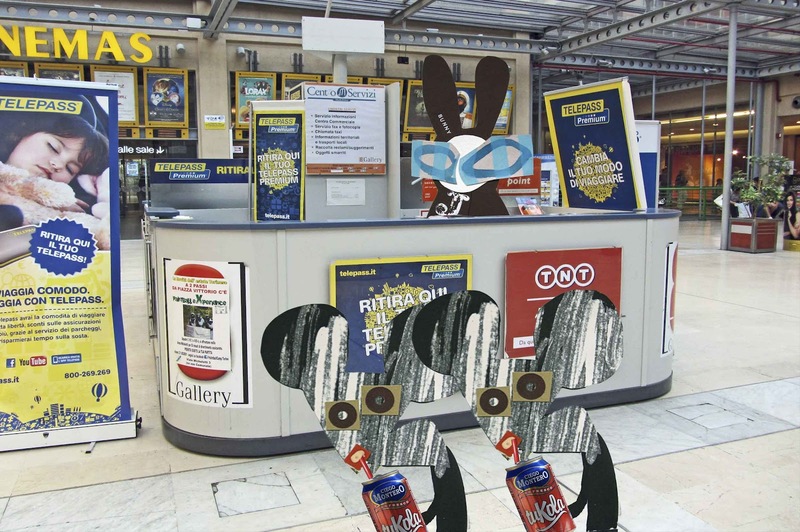 "Deals off," said the Wabbit, "but what do you think of your Cola?" "Warm," said the the first Ice Mouse. "Insipid," said the second. "Have you heard of Wabbit’s Cola?" asked the Wabbit cautiously. "I saw a can of that in a caffè round the corner," said an Ice Mouse. The Wabbit tried not to get excited. "Some Cola connoisseur of course," he suggested." "It was just sitting on a table, but the wabbit logo put me off," scowled an Ice Mouse. The Wabbit decided he would investigate this caffè but first he had to disengage from the Ice Mice so he adopted a disinterested air. "What film did you watch?” he asked with a bored face. "Ice Station Zebra," said an Ice Mouse and he studied the Wabbit very closely . "You do look familiar, what is your name?" he asked. "I operate on a first name basis," said the Wabbit. "My first name is Commander."